Fans of Ally Carter's Heist Society novels will love this teen mystery/thriller with sarcastic wit, a hint of romance, and Ocean's Eleven-inspired action. Julep Dupree tells lies. A lot of them. She's a con artist, a master of disguise, and a sophomore at Chicago's swanky St. Agatha High, where her father, an old-school grifter with a weakness for the ponies, sends her to so she can learn to mingle with the upper crust. For extra spending money Julep doesn't rely on her dad--she runs petty scams for her classmates while dodging the dean of students and maintaining an A+ (okay, A-) average. But when she comes home one day to a ransacked apartment and her father gone, Julep's carefully laid plans for an expenses-paid golden ticket to Yale start to unravel. Even with help from St. Agatha's resident Prince Charming, Tyler Richland, and her loyal hacker sidekick, Sam, Julep struggles to trace her dad's trail of clues through a maze of creepy stalkers, hit attempts, family secrets, and worse, the threat of foster care. With everything she has at stake, Julep's in way over her head . . . but that's not going to stop her from using every trick in the book to find her dad before his mark finds her. Because that would be criminal. MARY ELIZABETH SUMMER contributes to the delinquency of minors by writing books about unruly teenagers with criminal leanings. She has a BA in creative writing from Wells College, and her philosophy on life is "you can never go wrong with sriracha sauce." She lives in Portland Oregon with her partner, their daughter, and their evil overlor--er, cat. 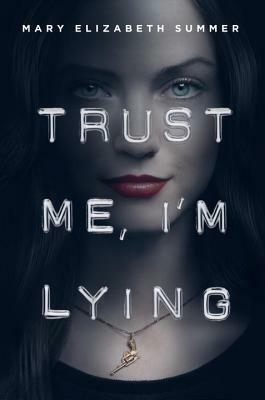 Trust Me, I'm Lying is her debut novel. Follow Mary Elizabeth's latest exploits on mesummer.com, maryelizabethsummer.tumblr.com, and @mesummerbooks on Twitter.